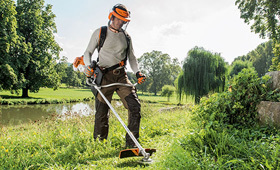 From mowing spacious grassy areas and tackling weeds to clearing forest stands, with the STIHL brushcutters for meadow and landscape maintenance, you will have no trouble facing these challenges. These robust tools reliably cut grass and remove weeds, and can even take on thickets and bushes. Select models are available in the comfort version (C) with ErgoStart (E) or with a loop handle (L).